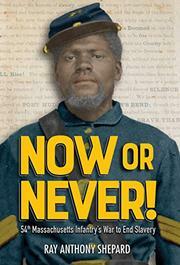 Two black Civil War soldiers and writers offer unique perspectives about how they fought on and off the battlefield. George E. Stephens and James Henry Gooding were both Union soldiers. The fact that they were African-Americans meant that the trajectory of their service and the weight they carried in battle were unusual. In their minds, they were fighting not just to preserve the Union, but to end slavery and secure their rights as full American citizens. The Quaker-educated men both joined the 54th Massachusetts Infantry Regiment, and both also wrote about what they saw, Stephens for the Anglo-American, a black Northern weekly, and Gooding for the New Bedford, Massachusetts, Mercury, both showing a different side of the war to blacks and abolitionists. They were skilled at sharing compelling details of the battles they fought in combat and against the racism that, among other things, denied them equal pay for their service. Author Shepard does a great job using the dispatches from these men to form the basis for this narrative. The most impressive contribution is how the individual voices of Stephens and Gooding are in the forefront with their similarities and distinctions. This is a powerful use of primary resources, one that illuminates the lives of its subjects but never gets in the way of their remarkable stories. Rich backmatter provides useful information.